There is no reference to distance education and/or online learning in the Education Act R.S.O, 1990. However, the Education Act, 1990 does make a reference to “equivalent learning,” which is defined as a learning situation that falls outside the instruction traditionally provided by a board, that is approved under paragraph 3.0.1 of subsection 8(1) and for which a pupil’s success can be reasonably evaluated. Ontario publicly-funded schools must report student enrollments in elearning classes to the Ontario Student Information System. Students who are enrolled in elearning courses as part of their regular day school, continuing education and summer school programs are to be recorded. Funding for e-learning day school programs in Ontario’s publicly-funded district school boards is the same as the traditional brick-and-mortar education. As part of the provincial strategy, students may enroll in an online course offered by another school board provided they do so through their home school. In such a situation, the applicability of provincially established fees for students taking e-learning courses are worked out locally between the two school boards. The fee for the 2017-18 school year was $769 per credit course. Private schools operate as businesses or non-profit organizations independently of the Ministry of Education, and in accordance with the legal requirements established by the Education Act. These private schools do not receive any funding or other financial support from the government. While all private schools in Ontario must meet the same general requirements, private schools seeking the authority to grant credits toward the Ontario Secondary School Diploma must be inspected by the Ministry of Education. Inspectors look for evidence of ongoing interactions between the teacher and students in the online learning environment, and for a direct link between the specific and overall curriculum expectations being taught and assessed in compliance with Ministry policy and observed practices. For any credit course delivered online by a private school, all of the curriculum expectations including hours of instruction, assessment, evaluation and reporting must be in accordance with the policies outlined in Growing Success: Assessment, Evaluation and Reporting in Ontario Schools-First Edition, Covering Grades 1 to 12 (2010) and the relevant curriculum documents. Each of the 60 English-speaking and 12 French-speaking school boards have the ability to offer some form of online learning using the Ministry-sponsored learning management system combined with the online curricular materials provided or their own. Many of the school boards also participate in one or more consortia designed to allow its school board members to work together to maximize their online offerings by sharing course offerings, resources and students (e.g., Ontario eLearning Consortium, Ontario Catholic eLearning Consortium, etc.). During the 2016-17 school year (i.e., most current data available), approximately 70,000 elearning courses were completed by more than 50,000 students in online learning programs offered by publicly-funded district school boards. The French-speaking school boards have developed a provincial consortium, Consortium apprentissage virtuel de langue française de l’Ontario, (CAVLFO) offering online learning. This is the equivalent of a high school in a virtual environment comprised of principal, counselors, special education and all other components found in regular high school. There are usually between 2,500 and 3,000 students per school year taking courses in the CAVLFO. Additionally, the Independent Learning Centre (ILC), which operates within TVO, delivers secondary school courses to both adolescent and adult learners. ILC credits count towards the Ontario Secondary School Diploma. The latest data that we have received suggests that there were approximately 20,000 students enrolled in the ILC. Finally, there are as many as eight different private or independent K-12 distance or online learning programs, some of which have also formed their own consortium. The most recent data available indicated there were approximately 12,000 students enrolled in private online schools. The Ministry of Education defines blended learning as instruction and student learning that incorporates digital resources in the face-to-face classroom. In addition to the various resources provided by the Ministry that were described earlier (e.g., learning management system, digital content and resources, Technology Enabled Learning and Teaching Contact, etc. ), the Ministry has also provided funding to school boards through the Technology and Learning Fund from 2014 to 2017 to implement innovative practices to transform learning and teaching. To build upon the work of the Technology and Learning Fund, in 2017-18 the government launched a new Innovation in Learning Fund, an ongoing investment to support educator professional learning to accelerate innovation in learning and the integration of global competencies. The Ministry does not track all of the instances of blended learning that take place in Ontario schools. The Ministry does provide licenses for a provincial learning management system, and digital tools for school boards to use for blended and eLearning opportunities with their students. As such, all educators in Ontario have the opportunity to use digital tools to provide a blended learning experience that meets their student needs. In the 2017-18 school year there were approximately 565,000 unique student logins in the learning management system (and, as stated above, more than 50,000 of these were students engaged in completing eLearning courses). Like many jurisdictions, the origins of K-12 e-learning in Ontario are found in the print-based medium. In 1926, the Correspondence Courses program (which later became the Independent Learning Centre) was established by the Ontario Department of Education “to provide elementary education for children living in isolated areas of northern Ontario”(Ontario Educational Communications Authority, 2016, para. 7). Courses covering the complete secondary school curriculum were available by the 1950s. There is actually some disagreement over the development of K-12 online learning in the province. For example, Barker and Wendel (2001) indicate that the first K-12 online learning established in the province was the Avon Maitland Distance Education Centre, which organized by the Avon Maitland District School Board in Ontario in 1994-95 (although the program did not offer any courses until 1997-98). As such, Barker, Wendall and Richmond (1999) claim that the first K-12 online learning program to actually offer courses was the Electronic Distance Education Network – a project originally designed by the Orillia Learning Centre of the Simcoe County District School Board to deliver high school courses to adults – during the 1995-96 school year. However, Smallwood, Reaburn and Baker (2015) argue that Virtual High School (Ontario) is the oldest K-12 online learning program in Ontario, offering its first course in 1995. By 2000, there were several district-based programs in operation in the province. Joining Avon Maitland and Simcoe, were school boards in Trillium Lakelands, Peel, Durham and Toronto – all of whom were operating in isolation and using a variety of systems. In September 2000, many of these school boards came together to form the Ontario Strategic Alliance for e-Learning. This Alliance operated under a co-operative model where each district was responsible for writing two courses and student enrollments were shared across the Alliance. This Alliance would eventually grow into the Ontario e-Learning Consortium by the 2005-06 school year. In September 2004, the Ministry of Education began to play a more active role. The first steps involved a survey of all of the distance education courses currently being offered throughout the province, which eventually led to the decision to host a provincial course management system and create a standard set of online courses that all school boards could use. Since 2006, the Provincial e-Learning Strategy has guided the Ministry to provide school districts with various supports necessary to provide students with online and blended learning opportunities, as well as providing e-learning leadership within the provincially funded school system. School districts are responsible for the delivery of online learning. 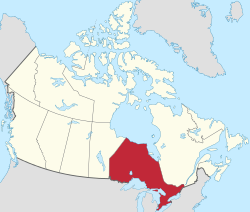 It should be also noted that the French-language school boards in Ontario have also been active in distance education, and this activity is believed to have a longer history than that of the English language boards. Unfortunately, there is little published information in English about this activity. Smallwood, J., Reaburn, J., & Baker, S. (2015). Virtual High School (Ontario): A case study of an online private school. In T Clark & M. K. Barbour (Eds. ), Online, blended and distance education in schools: Building successful programs (pp. 144-155). Sterling, VA: Stylus Publishing. * This is the number of students enrolled in blended courses. ** The Consortium represents 12 individual French-language district school boards. These figures represent the combined totals for all 12 programs. A student registered in an Ontario school who takes a course from an online program in another province, territory or country is able to receive recognition for the learning through the Prior Learning Assessment and Recognition (PLAR) challenge process. Under this process students have their skills and knowledge evaluated against the overall expectations outlined in the appropriate provincial curriculum policy document to receive credit towards their Ontario Secondary School Diploma (OSSD). PLAR procedures are carried out under the direction of the school principal who grants the credit. Students may be granted a maximum of four credits through the PLAR challenge process. Ontario’s publicly funded school boards may offer online programs to students living outside of Ontario provided they do not use the provincial learning management system which is licensed for use only by Ontario students and educators. A credit is granted in recognition for the successful completion of a course that has been scheduled for a minimum of 110 hours. Credits are granted by a principal on behalf of the Minister of Education for courses that have been developed or approved by the Ministry. For the purpose of granting a credit, scheduled time is defined as the time during which students participate in planned learning activities designed to lead to the achievement of the curriculum expectations of a course.